After the various radio shows and web sites devoted to the strange objects in Saturn’s rings and on many of its moons this story becomes just another anomoly of that most mysterious of planets. A mysterious giant hexagon lies above Saturn’s north pole, captured by cameras on Nasa’s Cassini Orbiter. Spanning 25,000km – equivalent to the width of two planet Earths – the bizarre geometric feature appears to remain virtually still in the atmosphere as clouds swirl around it. The infra-red images show the hexagon – which contains a smaller six-sided formation – extends about 60km down into the clouds. The hexagon is similar to Earth’s polar vortex, which has winds blowing in a circular pattern around the polar region. 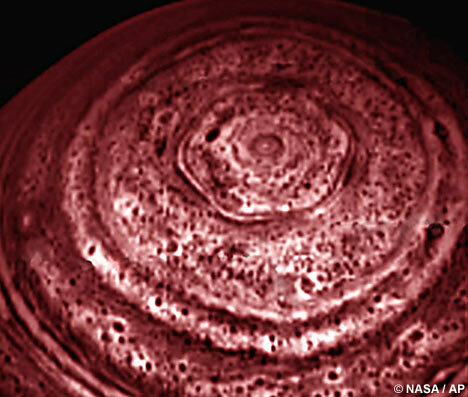 On Saturn, the vortex has a hexagonal shape. The six-sided shape is in stark contrast to the swirling, hurricane-like vortex at Saturn’s opposite pole. The feature was first photographed more than 20 years ago by Nasa’s Voyager 1 and 2 probes, but this is the first time the hexagon has been seen in one image. The latest pictures were taken at nighttime using infra-red because the pole is currently in darkness and the red colour indicates the amount of heat being generated from inside the planet. Kevin Baines of NASA’s Jet Propulsion Laboratory in Pasadena, California, said: "This is a very strange feature, lying in a precise geometric fashion with six nearly equally straight sides. "We’ve never seen anything like this on any other planet. Indeed, Saturn’s thick atmosphere where circularly-shaped waves and convective cells dominate is perhaps the last place you’d expect to see such a six-sided geometric figure, yet there it is."